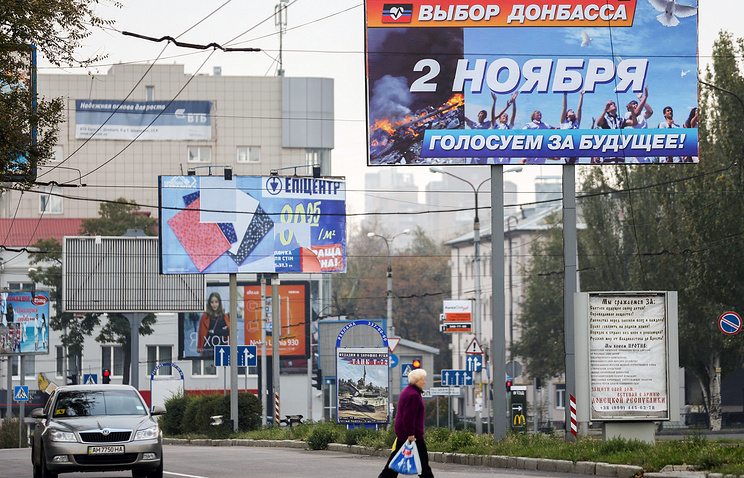 DONETSK, November 2. /TASS/. Polling stations opened at 8 am Moscow time in the Donetsk People’s Republic and the Luhansk People’s Republic, which elect on Sunday its leaders and lawmakers of local parliament. Local residents of Donetsk People’s Republic who have reached the age of 16 will be able to vote at 363 polling stations, three of which open in Russia for refugees who have fled the war-torn east of Ukraine. In Luhansk People’s Republic local residents reaching the age of 18 will be able to vote at more than 100 polling stations, including five opened at temporary accommodation centres for Ukrainian refugees in Russia’s Rostov, Voronezh and Belgorod regions. There is no minimum voter turnout requirement in the election in both regions. Polling stations will work until 8pm Moscow time, but if necessary some polling stations can be closed ahead of time for security reasons. Several innovations were introduced in the run-up to elections in the Donetsk People’s Republic. For instance, local authorities decided not to hold a traditional ‘day of silence’, when canvassing is banned a day before voting. ‘The day of silence’ is just ‘not planned by the effective election law,” head of republican CEC Roman Lyagin said. Meanwhile, republican residents over 16 can vote for a candidate to the post of the head of the self-proclaimed republic or a candidate for lawmaker. One more innovation became an option to vote in the Internet. Those who live in regions of Donbass (Donetsk and Luhansk regions in Ukraine’s south-eastern industrial area) which are currently under control of Kiev law enforcers can vote through the Internet. A total 363 polling stations, including three in Russia where refugees from south-eastern Ukraine will vote, will be opened on the election day. No minimal voter turnout is set to find election valid, around 3,198,000 have the right to vote. The issue on a date of an inauguration ceremony of the newly elected leader of the self-proclaimed republic remains open. “There are several variants, when it may be held, but I cannot name them yet,” Donetsk republican CEC chief Lyagin said. “An inauguration ceremony will be held at a Donetsk theatre, we are still thinking over an oath of the parliament. We will do not a quite pompous, but bright swearing-in ceremony which will be interesting for spectators and journalists,” he said. Incumbent Donetsk republican leader, Prime Minister Alexander Zakharchenko, First Deputy Prime Minister of parliament of Novorossia, a federative state formed by the self-proclaimed republics, Alexander Kofman and lawmaker of the Supreme Council of the self-proclaimed republic and veteran of special police force Berkut Yuri Sivokonenko are running for the post of Donetsk republican head. All of them call for soonest attainment of peace in Donbass, restoration of infrastructure and residential houses destroyed in military actions and settlement of social problems. The Donetsk republican prime minister said repeatedly in pre-election and working trips that social payments to teachers, pensioners, students should be started and regional infrastructure should be restored first of all. Meanwhile, in his words, Donetsk republican cities of Slavyansk, Kramatorsk and other cities occupied by Ukrainian law enforcers should be brought back to the self-proclaimed republic. Sivokonenko insists on Donetsk People’s Republic’s accession to the Customs Union of Russia, Belarus and Kazakhstan. “We are strongly linked with Ukraine, but I call with all my soul and heart for integration, including Donetsk People’s Republic’s entry in the Customs Union,” he told TASS. Economy can be restored only through economic co-operation with Belarus and Russia, he said. Alexander Kofman comes out for establishment of a common state with the Luhansk People’s Republic called Novorossia. However, settlement of humanitarian problems in Donbass is among his priority tasks. Movement Donetsk Republic with Zakharchenko on the top of its election list and Free Donbass led by public figure Yevgeny Orlov well-known in the Donetsk People’s Republic will vie for seats in the People’s Council, local parliament in the Donetsk People’s Republic. First Deputy Prime Minister of the Donetsk People’s Republic and chairman of Donetsk Republic movement presidium Andrei Purgin and former chairman of Donetsk republican Supreme Council Presidium Denis Pushilin are in the top trio of Donetsk Republic election list along with Zakharchenko. “Election campaign of the Donetsk Republic movement is a programme of people’s economy, people’s Donbass without oligarchs,” Purgin said in his visual. Free Donbass movement intends to fight for power of people, openness and social justice for Donetsk republican residents of all nationalities and build-up of inter-ethnic peace and accord in the country. According to sociological surveys, 51.3% of voters want to vote for Donetsk Republic and 31.6% prefer to vote for Free Donbass. Around 300 observers from Russia, South Caucasian Republic of South Ossetia, Serbia, Montenegro, Israel, France, the United States and other countries came to control elections in the Donetsk and Luhansk People’s Republics. An unofficial delegation of lawmakers from Russia’s parliament lower house State Duma representing different parties as well as observers from the European Parliament and national parliaments, representatives of political parties, movements and non-governmental organisations are among them. “Only elections will bring peace to Donetsk and Luhansk People’s Republics. We hope that elections will pass calmly, fairly, openly and will meet all international standards,” Bulgarian lawmaker from Ataka party Magdalena Tasheva who came to the region said. Several State Duma deputies representing political parties will observe polls in the self-proclaimed Donetsk and Luhansk People’s Republics in an unofficial delegation, an informed source in the lower house said earlier. Leonid Slutsky and Aleksey Didenko from the Liberal Democratic Party of Russia (LDPR), Alexander Yushchenko and Vladimir Rodin from the Communist Party of Russia, Mikhail Bryachak and Oleg Pakholkov from A Just Russia and Aleksey Zhuravlev who chairs Rodina party and is also a member of United Russia faction in the State Duma are among them. 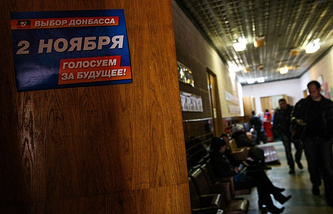 Lawmakers will observe the voting in Donbass as representatives of their parliamentary parties and “the State Duma will send no official mission” for these polls, the source said. The legitimacy of elections in the Donetsk and Luhansk People’s Republics began to be discussed immediately after statements of authorities in the self-proclaimed republics about their plans to hold polls on their territory. Shortly before elections the tonality of statements was also finally determined, as Russia finds upcoming voting as a positive step towards settlement of the situation in Ukraine, whereas the West states about illegitimacy and undesirability of voting for residents of the self-proclaimed republics. Due to more insistent demands voiced by Kiev authorities and several Western countries ahead of polls not to hold them Russian Foreign Ministry has issued a statement saying that elections in the Donetsk and Luhansk People’s Republics are held in line with the Minsk peace deals and give a chance to put the situation in southeast Ukraine on the track of constructive talks. Russia is ready to recognise results of elections of People’s Councils and leaders of the Donetsk and Luhansk People’s Republics which “will be important for legitimisation of power,” Russian Foreign Minister Sergey Lavrov said. Meanwhile, UN Secretary-General Ban Ki-moon, officials from the Parliamentary Assembly of the Council of Europe (PACE), NATO, OSCE Chairperson-in-Office and Swiss President Didier Burkhalter, representatives of the United States and several their European allies said that elections in the self-proclaimed republics would be allegedly illegitimate and contradicting the Minsk peace deals. The self-proclaimed Donetsk and Luhansk People’s Republics were formed in spring 2014 on the territory of Donbass (Donetsk and Luhansk regions in Ukraine’s southeastern industrial area) after referendums. In response, Kiev started a military operation. Active hostilities stopped only after peace deals stipulating a special status for Donbass were signed on September 5 in Minsk. In September, the self-proclaimed republics adopted laws on elections of the republics’ heads and deputies of people’s councils. On the whole, 2.2 million people live in the Luhansk Region, and 4.3 million people reside in the Donetsk Region. The share of Russians in the population reaches 39-40% Both territories are centers of the coal, metallurgical and mechanical engineering industries.